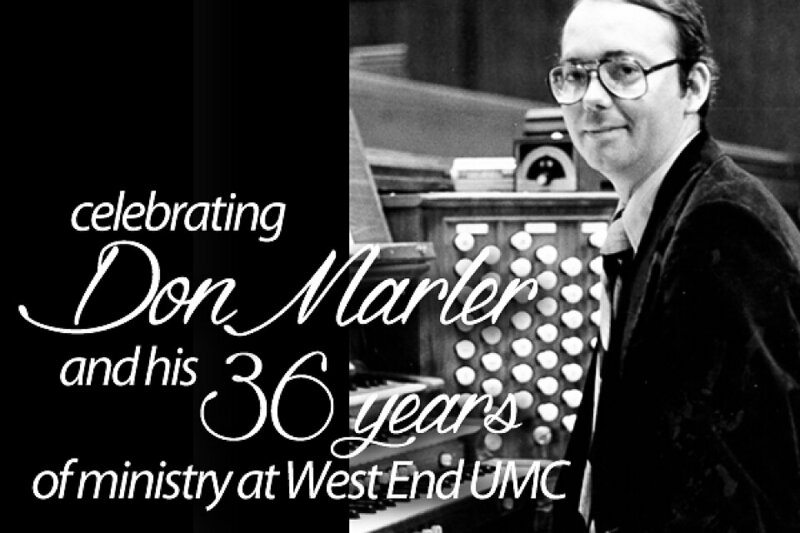 As many of you know, Don Marler is retiring from his role as Minister of Music after 36 years at West End. While there is no way to adequately thank him enough for the impact he has had on our church, we have wonderful plans to celebrate Don in a very special way. Don's Last Sunday - Don’s last Sunday at West End will be August 24 and at the 11 a.m. service there will be additional music as well as a presentation regarding Don’s role in making beautiful music and worship happen for West End all these years. All Church Reception - Between 5–7 p.m. on August 24, there will be an “all church” reception at the home of Judi Rice at 2026 Fransworth Drive in Hill Place. This will be an opportunity to “toast” Karen and Don, thanking them for their dedication and to have extended conversations for their outstanding ministries. Please RSVP to Sallie Norton at sallienorton@gmail.com if you plan to attend the reception. Submissions - If you would like to send Don a letter of appreciation, pictures or your memories of Don’s time here as Minister of Music, please send them to WEUMC c/o Melanie Paulson, 2200 West End Avenue Nashville, TN 37203. We are creating a memory book which will be presented to Don, so it is important these be received by August 1. Monetary Gifts - Also, monetary gifts of appreciation should be made payable to WEUMC with a note on the check that denotes the gift should go to Karen and Don Marler. We will combine these gifts and present the gift to them on August 24. Please send your checks for Karen and Don by August 15 to Melanie Paulson at the above address. The monetary gifts for Karen and Don will not be tax deductible. Note the deadline for letters, pictures and memories is August 1 and for gifts is August 15, so PLEASE mark your calendar now so you can participate in this special occasion in the life of West End United Methodist Church. For further questions, please contact Melanie Paulson at 615.321.8500.